SOS Forum • Cassette Tapes are back? ken long wrote: Aaaahh... but that's compressed audio, like MP3. I much prefer the term 'data-reduced' as it allows far less room for misunderstandings. But while MiniDisc does indeed use data-reduction, (called ATRAC) it's worth noting that it is actually a far more sophisticated and advanced form than MP3. Except for those of us who still have our minidisc recorders! Aaaahh... but that's compressed audio, like MP3. Better than MP3 though I would aver? I have done (unscientific and v limited) test copying CD to MD and I could not tell a difference but I understand some music genres are more demanding than others? Choral work e.g? But as I said earlier, I would be quite happy for a MD to have the same playing time as LP but 16 bit linear. I understand the CD was originally going to be smaller and with less time? The "wives tale" is that the size was insisted upon to get the playing time and the odd sampling rate for much the same reason (the disc HAD to fit a Euro car slot?) I mean, why are they not 48kHz? Butty but..Tape is NOT compressed?!! I have an AES journal article about a tape pre-distortion unit and it is said listening to what tape actually does to sound is horrendous! Sorry Hugh, did not see your reply. I did not get the warning this time, have they scrapped the idea? Never stopped me making a (***) of meself anyway! Hugh Robjohns wrote: But while MiniDisc does indeed use data-reduction, (called ATRAC) it's worth noting that it is actually a far more sophisticated and advanced form than MP3. It had the ability to block out all bagpipe, accordion and banjo sounds? Brilliant! ef37a wrote: The "wives tale" is that the size was insisted upon to get the playing time and the odd sampling rate for much the same reason (the disc HAD to fit a Euro car slot?) I mean, why are they not 48kHz? Last question first, The reasons CDs (and the standard for other commercial music) use a 44.1kHz sample rate is entirely due to Mr Sony having a warehouse full of NTSC U-matic recorders. Prior to Sony's development of the CD format early digital audio experimenters were generally working with bespoke hardware recorders of various types and sample rates of 50 or 60kHz. Of course, it was clear that the sample rate had to be sufficient to allow a 20kHz bandwidth, which meant a rate of greater than 40kHz, but higher sample rates were increasingly difficult to generate so Mr Sony wanted to keep it as close to 40kHz as he could. It was also clear that 14 bit wordlength was the minimum for an acceptable dynamic range in a consumer product, with 16 bit as the target for professional applications (at that time that was the absolute state of the art). Being in Japan, the Umatic video recorders worked with a 30 frame, 525 line (B&W) video format. Not all of the video lines are available in a rotary-head video recorder because of the head-switching, and they settled on using 490 lines for the digital audio. It was also essential that whole audio samples are stored per line (rather than splitting them over adjacent lines), and with 16-bits per sample the video resolution allowed three samples per line plus some basic error protection coding. So, do the maths: 3 samples per line x 490 usable lines per picture frame x 30 frames per second = 44100 samples per second! And that's why we're stuck with 44.1kHz as the basic audio sample rate. Amusingly, when Mr Sony went on to develop a European PAL (635 line/25 frame) version of the hardware, the ended up using the same 3 sample per line structure, but 588 active lines, so the sums are 3 x 588 x 25... which also equals 44.1 samples per second! Later, when it came to sound on digital video recorders it became necessary to ensure a whole number of audio samples per video frame (to allow easy editing). Although 44.1 obviously works with 25 fps PAL and 30fps B&W NTSC, it doesn't work with 29.97 fps colour NTSC or 24fps film. The next lowest available number that does work is 48kHz, which works perfectly with PAL, B&W NTSC and film. It still doesn't work with 29.97 colour NTSC but nothing practical will anyway... but there is an easy bodge where five frames of 29.97 hold a whole number of audio samples. So 48kHz became the standard sample rate for all things video. It would have been so much better had the original CD audio sample rate been selected as 60kHz (which would work for all video formats in the same way as 48k does), as then we would have had no need for double (96k) rates etc.. but such is life! As for the physical size of the CD, the limiting factor was a disc that would fit in a standard ISO-sized car hi-fi unit. The alleged requirement to accommodate sufficient play time for a Beethoven symphony was obvious, but probably secondary, and there was some wriggle room anyway in the choice of the linear rotational speed and data coding format! Thank you Hugh and I bet that all came out of your head! I would love to know what politking went on to keep the MDisc out of car audio? The format is so obviously better suited having intrinsic protection. The vulnerability of the cassette has been touched upon and of course, despite great claims for it at the time, the CD will not put up with very much abuse. MD sound quality is, as you say, very good if not quite 16bit linear but in a car?! The MD can also record double time and again the quality loss for ICE would not be an issue for the majority of people. I recall the Great Four Channel Fiasco and I believe Philips would not relax the patent to allow 4 tracks one way? Had they done so maybe 4CH would have taken off and all those silly disc coding systems swept aside? ef37a wrote: Thank you Hugh and I bet that all came out of your head! It did... but then I've been teaching that kind of stuff to students for over twenty years now! I would love to know what politking went on to keep the MDisc out of car audio? I don't think it did. MD was a hugely popular format in the US and Japan, and there were a great many in-car MD players. It just never really caught on that well in the UK. The format is so obviously better suited having intrinsic protection. Absolutely. The manufacturers learned from the mistakes of the CD format. They thought the biggest problem with CD would be dropouts due to pin-holes in the mirrored layer, so that's what they optimised the error protection system to deal with. However, the mirroring was quickly perfected and the real issue was deep surface scratches and optical contamination (grease etc) which caused mistracking and defeated the error protection systems. Encasing the disc in a plastic box removed those risks very effectively. I still have several working MD devices. Three in-car players (in storage now mind you but not yet consigned to the tip) and my ballet teacher wife used them as an upgrade from cassettes (which the dance festival world used from the very early days and most festivals still have cassette playback as an option). MD was superior in almost every way to cassette and has a fair few advantages over CD (recordability, editability, shock resistance on playback and robustness....). Car manufacturers in the UK were never going to fit MD players in cars as standard without a MD customer base that was as large as for cassette players (and subsequently for CD players after the fairly quick changeover to CDs being the main music medium). Most of Joe Public weren't interested enough in the crossover period from analogue to digital to have a record player, cassette player/recorder, CD player and minidisc player/recorder at home to make MD players as standard in cars worthwhile. The anti-copy systems on digital media also meant that someone would probably be unable to copy from a CD to MD very easily (never had one so don't know how successful or widespread this was), whilst copying from record or CD to a cassette was easy, and generally the cassette sound quality was good enough for the car. Thanks Hugh for that great read about the 44.1 kHz story! You could write a book on that and I for one would buy it! Wonks wrote: The anti-copy systems on digital media also meant that someone would probably be unable to copy from a CD to MD very easily (never had one so don't know how successful or widespread this was), whilst copying from record or CD to a cassette was easy, and generally the cassette sound quality was good enough for the car. Copying to a Sony minidisc was easy, basically drag and drop to Sony's branded Jukebox/Media player (I forget the name, maybe OpenMD?) then copy to disc. Copying back was fine except it changed the format to NetMD such that it could only be played on OpenMD. The standard installation for OpenMD changed every mp3/WMA/WAV file it found on your hard drive into Sony's preferred format, even your own unprotected tracks! Undoing the damage was a nightmare. I remember someone here posting that if Sony had a school report it would say 'doesn't play well with others'. How true. Thanks for that picture and the explanation Hugh - just last night I was trying to explain the idea of digital audio stored on video tape to a video editor friend of mine who hadn't come across the idea before. We have a mutual friend with some PCM-F1 tapes and my video editor mate has a working Betamax machine but I had no idea what the tapes would look like if he tried to play them. It was an age ago but I am pretty sure I copied CDs from a PC with a 2496 card. Output via S/PDIF and a cheap co-ax/optical converter. The card stripped out any copy protection? Mind you, no great loss doing it annylogically! James Perrett wrote: Thanks for that picture and the explanation Hugh - just last night I was trying to explain the idea of digital audio stored on video tape to a video editor friend of mine who hadn't come across the idea before. We have a mutual friend with some PCM-F1 tapes and my video editor mate has a working Betamax machine but I had no idea what the tapes would look like if he tried to play them. The consumer (PCMF1) generation of PCM adapters used a slightly different video structure from the professional 1600 series. Basically the same idea, but with fewer synching pulses and more of the horizontal line used for data. The most significant bit (MSB) of each sample is to the left, so you can see the signal cycling between +ve and -ve peaks as the changing broad black and white vertical sections. As you move from left to right across each line you can see six distinct samples (three pairs of left-right couples). 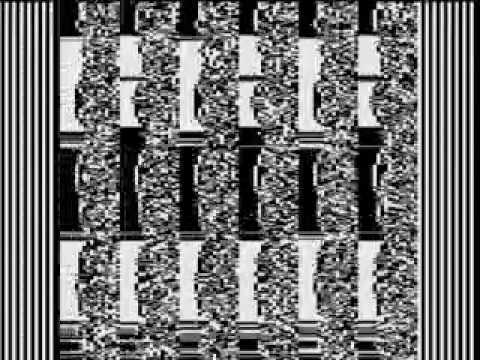 These are all 14 bits wide. The louder the signal, the more bits in each sample start getting toggled and the narrower the black and white left-hand stripes become. Then there is another chunk which carries bits 15-16 for each sample, and then some housekeeping and error protection data to finish off the line. Thanks Hugh - I have a copy of Sony's Digital Audio and Compact Disc Technology book from 1988 which covers all the data formats but it doesn't show any pictures of what they look like if played on a normal video recorder. One thought that has just occured to me - I wonder if anyone has created a software decoder for these formats that works with a video capture card on a computer? Yep, sounds about right. Lovely hardware, horrible software. I guess how sony handles its items is their business but idk. I've never been an expert but its interesting to read the comments of yours, the people who can tell so much about all these specific crates of audio aspects, im impressed. Er... it is a compressed format. And so is MP3. I didnt mean it is equivalent. Better than MP3 though I would aver? Yes, lol. But still compressed.